Get Ready for Cold & Flu Season with Braun Thermometers! Well, unfortunately Cold & Flu season is here again! My house has already been hit by both and it is isn't even winter!! With three little ones and a husband (who might tend to act like a little one when sick...), I am always reaching for my thermometer to keep an eye on my children's temps! As a health professional and mother, I reach for Braun thermometers because they are the number one recommended brand by pediatricians - and moms alike. And I love how innovative their thermometers are and are so great for not making sick children more cranky! 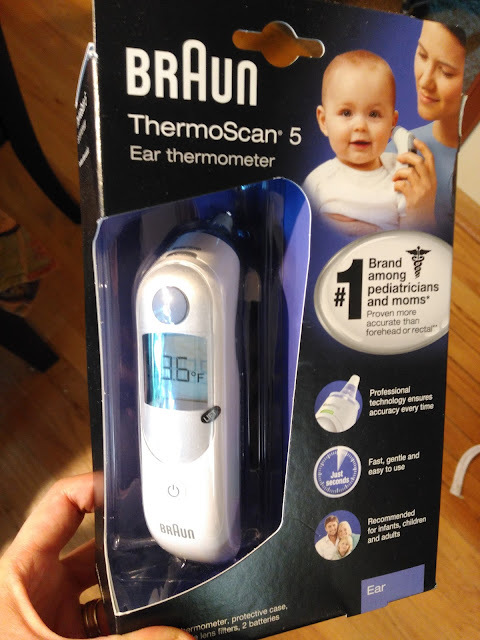 They have two types that I really love - the No Touch + Forehead thermometer and the Braun ThermoScan Ear Thermometer. 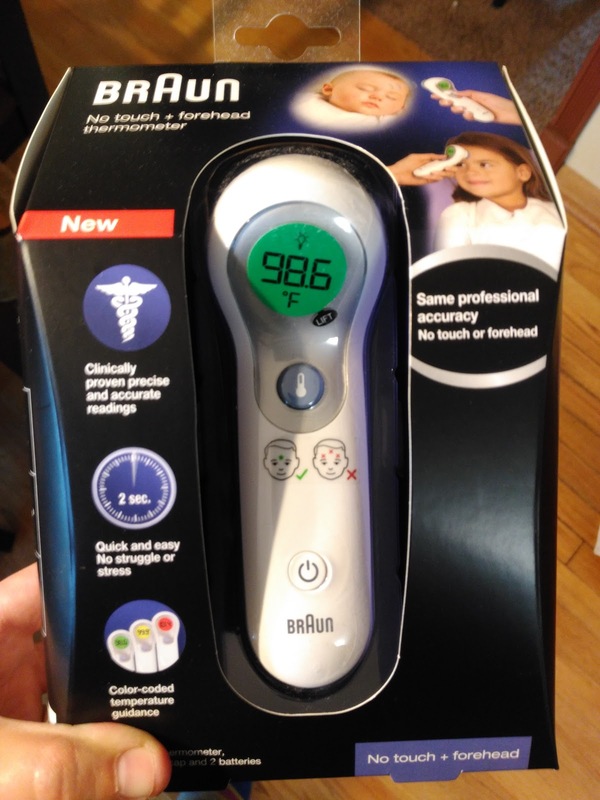 The No Touch + Forehead thermometer allows two ways for the temperature to be taken - on the forehead, as well as simply by holding the thermometer close to the forehead, allowing for the child's comfort. We have been using a forehead thermometer for years but I love that this is the first and only thermometer with both no touch and touch functions. It uses a new, revolutionary technology that ensures clinically accurate and consistent readings, with gentle convenience. I LOVE that the Braun No touch + forehead thermometer gives you accurate readings instantly and if I have a really cranky one, I don't even have to touch them with the thermometer! The built-in accuracy sensor guides you to the right distance to take a reading! This is so great for when children are sleeping and you don't want to wake them! They have thought of everything because they also included a silent mode for sleeping baby and a fast 2 second reading! Plus, it features an easy fever guidance with a large, color-coded screen that allows instant fever detection. A green screen indicates no fever is detected, yellow suggests a slightly elevated temperature, and red signals a possible high fever may be present. The Braun ThermoScan Ear Thermometer is a popular choice among moms because the ear canal is the most accurate site to measure a fever. Thanks to Braun’s patented pre-warmed tip and ExacTemp® technology, Braun ThermoScan® is widely regarded as a benchmark for accuracy and reliability. If your child will let you, this is one of the best thermometers to use for the most accurate reading! Braun has really tried to make it work for everyone because they have included a patented pre-warmed tip that ensures accuracy and the ExacTemp® guidance system function: light & beep alert for accurate positioning. It is fast, gentle and easy to use and it always includes the last reading to track temperature. The package includes hygienic disposable lens filters which are BPA and Latex free. With the holidays quickly approaching, these thermometers would make a useful stocking stuffer for new moms or moms-to-be!